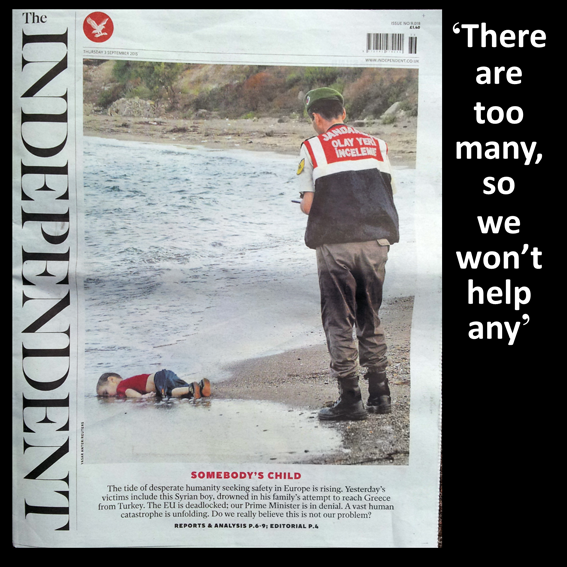 • Some have strongly objected to the front page photo published today by The Independent of a dead Syrian boy washed up on a Turkish beach, whose family was trying to escape war and terror. This photo is too upsetting, said many. However, similar objections were made when photos were released of the Bergen-Belsen Concentration Camp after the Second World War, but only then did the world start to fully understand the true horrors of the Holocaust. Now, the world needs to understand this worldwide refugee crisis. Maybe this photo will at last open eyes - especially those of the British government, which has stated that it doesn't want to offer asylum to refugees. The poor, the unemployed, the homeless, the disadvantaged - many of them in Britain think it’s them or us. Refugees fleeing terror, war and torture? We’re full. People here need looking after first. Charity begins at home. We don’t want them. We can’t afford them. The reaction of Britain's Prime Minister, David Cameron, to the worldwide crisis of refugees is to say that there are too many, so basically, we can't help any. Britain has opted out of UN and EU schemes to accept asylum seekers under a quota system. According to the Home Office, 4,866 Syrian nationals have been granted asylum in Britain since 2011. However, over 11 million Syrians have fled their homes in the war-torn country, and about 4 million Syrian refugees are being hosted by five countries. Europe has received around 150,000 Syrian refugees. Germany has said it will take 800,000 refugees this year. But the UK has indicated it will not take in any more. A United Nations officer said that, "Britain could do more". A government that’s callous enough to turn its back on hundreds of thousands of ravaged, terrorised people fleeing for their lives to seek refuge in Europe is the same callous government that will turn its back on the growing numbers of Britons who have to use food banks; who are desperate because they’re too ill to work but the government won’t believe them; who can’t afford a home; who are struggling to make ends meet; who are bearing the severest brunt of austerity measures whilst the rich are laughing all the way with the bankers. It’s not them or us. It’s not either / or. It’s neither. This is not a ‘Jekyll and Hyde’ government, benevolent and caring towards our poor and downtrodden, but circumspect about helping those ‘not of us’. If this was a compassionate, caring government, concerned and considerate towards our poor and struggling, it would show the same face to those now frantically banging on our door perilously screaming for our help. Many Britons mistakenly believe that letting in refugees represents a threat to them, their livelihood, their prospects, their chances. But the threat isn’t the refugees. The threat is a government that doesn’t care about our struggling and desperate as much as it doesn’t care for those struggling and desperate on our horizon, just beyond our borders, gasping and dying for rescue. This shouldn’t be a competition between needy people. A government that was naturally humanitarian would be doing all it can to help all it can. But this is a Conservative government; the first true, blue, fully fledged Tory government of this millennium. And barely past its first 100 days of office, it has shown itself to be mean, nasty, cold and selfish. Our new government is happy to promote the idea that all foreigners wanting to come here are ‘migrants’ – and that they’re mostly unwanted and unworthy and we can’t afford them. Never mind that all migrants are not the same – that EU migrants, non-EU migrants, illegal migrants and asylum seekers are all completely different categories and cannot just be lumped together. Never mind that migrants provide a net profit to the country, and give more than they take. Never mind; convincing our indigenous population that all or most foreigners and migrants are a threat to them serves this government well. It means that we blame foreigners for our problems, rather than the government. The world is in peril, with the most organised, vicious terrorist armies marching ‘blitzkrieg’ style across huge swathes of Iraq and Syria, swallowing and destroying ancient cities, committing genocide, enslaving women, beheading their husbands, and subjugating hundreds of thousands of innocent victims to a life worse than death. We are witnessing an exodus of 60 million refugees, half of them children, desperate to escape unimaginable circumstances in countries that in recent times we helped to bomb back to the Stone Age, then left, leaving behind governments totally inadequate to defend themselves. And our agenda in response? The government is committed to scrapping the Human Rights Act – at exactly the time when human rights need to be championed, not jettisoned. The government is spending hours of Parliamentary time debating and preparing minutiae of detail for a referendum on whether to leave the European Union – just at a time when we should be more closely tied with our EU allies in the face of a looming, planetary disaster. The government is spending millions dropping bombs on Iraq, and now wants Parliament to agree to drop bombs on Syria too, that may haphazardly kill some terrorists, but are more likely simply to turn many more innocent citizens into refugees that we won’t help because there are too many already. And the government is turning its back on the world’s worst refugee crisis; showing itself to be deaf to the frantic howls of refugees clinging to the forlorn hope that we might help; showing itself to be blind to the images of dead children who can scream no longer as they are lifelessly washed ashore. We will take in asylum seekers, but only if they get here by illicit means; risking life and limb to hide in a truck or hazardously make it through the Channel Tunnel, knowing that if they manage to reach British soil we must, under international law, accept them, but otherwise, we won’t let them come here easily or safely, because we don’t want them. Welcome to Conservative Britain of 2015; giving Britain a new image of being heartless, inhumane and self-serving.